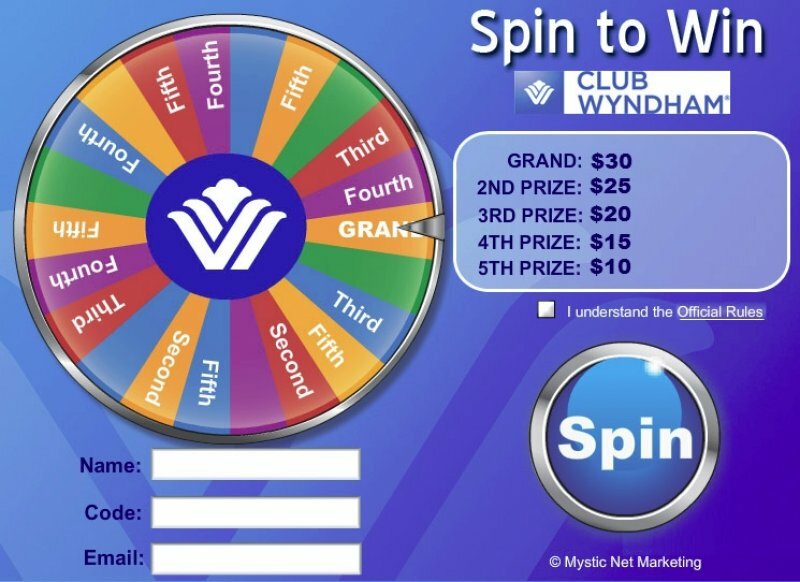 A Virtual Spinning Prize Wheel is an incentive-based promotion and a very creative tool for both small and large businesses. 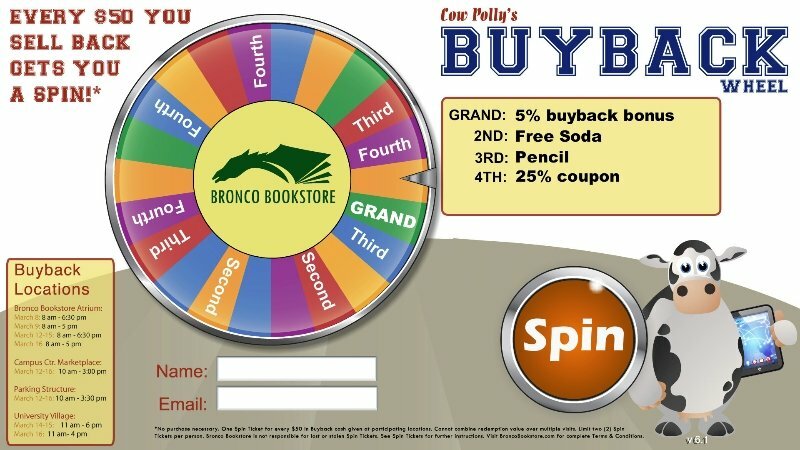 The Virtual Prize Wheel works to drive current and or potential customers to your website by giving them the opportunity to win prizes and coupons. It can run from your website, point of purchase counter, trade show, retail kiosk or mobile website. 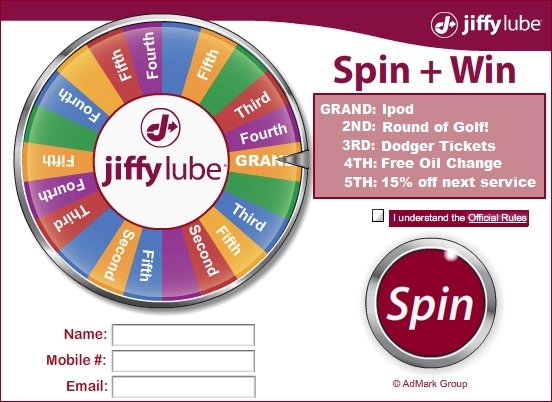 With the Interactive Prize Wheel, you set the odds, the quantity, and prizes or coupon types. 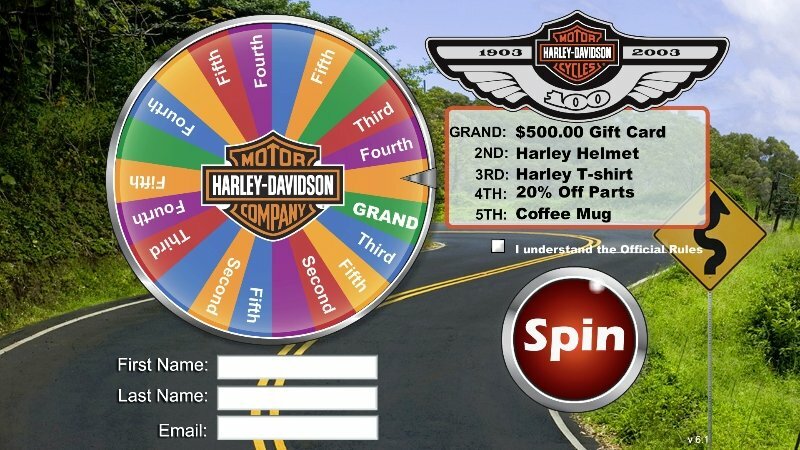 The prize wheel works around the clock acquiring names and email addresses of consumers that are now familiar with your business to build your business a large database. 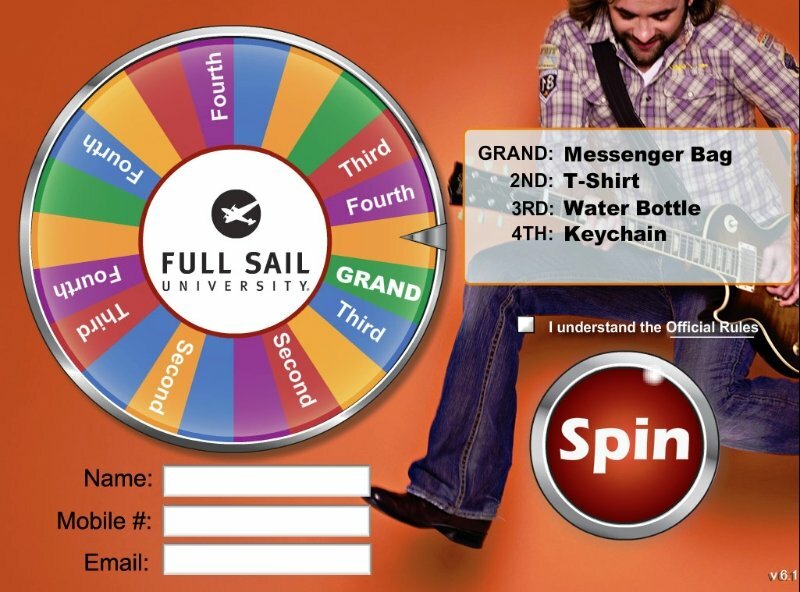 The Virtual Prize Wheel will help small businesses to build a large email database by capturing names and email addresses of website visitors. This will in turn lead to new customers being acquired and thus generate new sales. The incentive of winning a prize will generate traffic to the website and increase brand awareness. 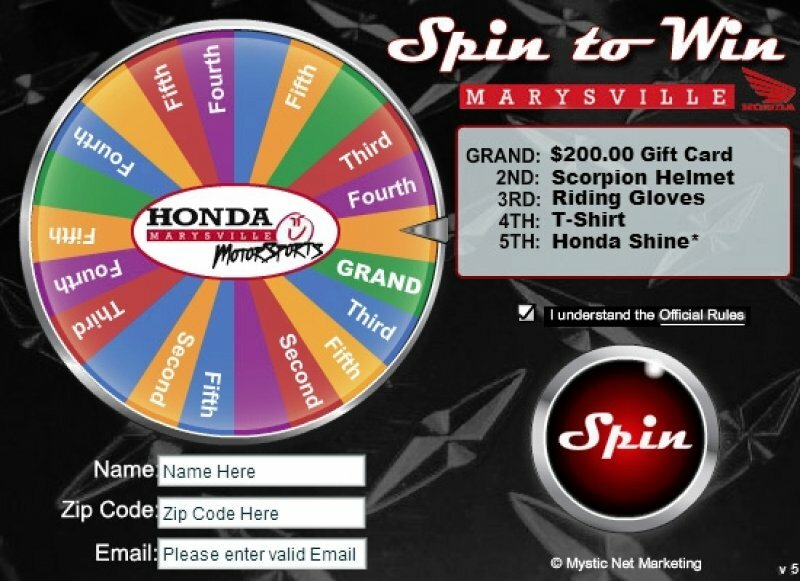 The instant win marketing that comes with the use of the Interactive Prize Wheel creates instant gratification for website visitors. The interaction and sense of fun creates positive Public Relations and brand awareness. To boost foot traffic, businesses with physical locations can direct winners to collect the prizes from their physical location. 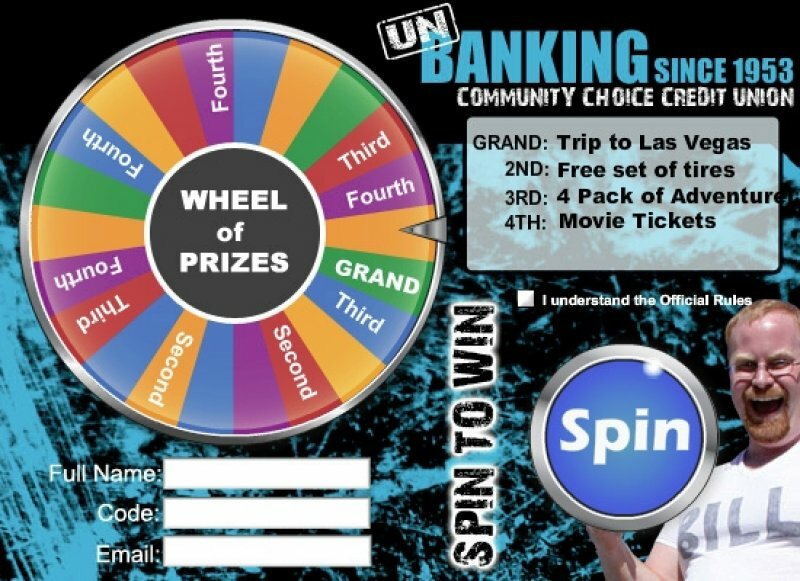 The interactive prize wheel can also be used to fill in slow days by making the slow days, such as Monday to Thursday the only days when prizes can be redeemed. It is a unique and creative form of branding which small businesses can enjoy. Promote new products and services because of its great potential to drive traffic to your website. 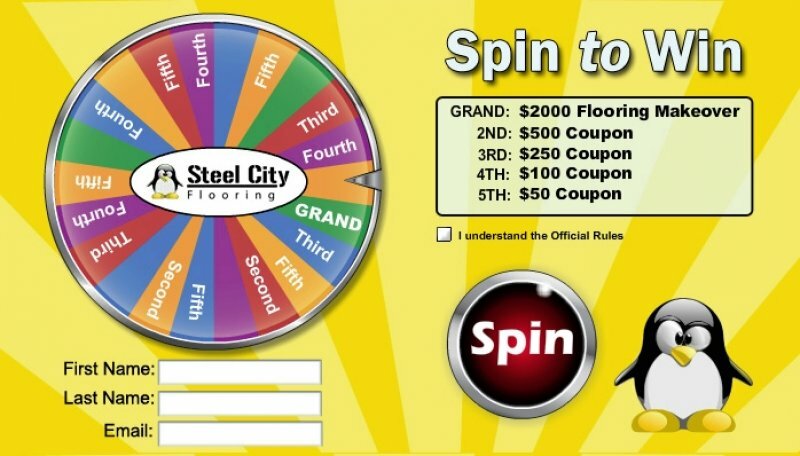 The Interactive Virtual Prize Wheel may also be used for an online store using coupon codes. 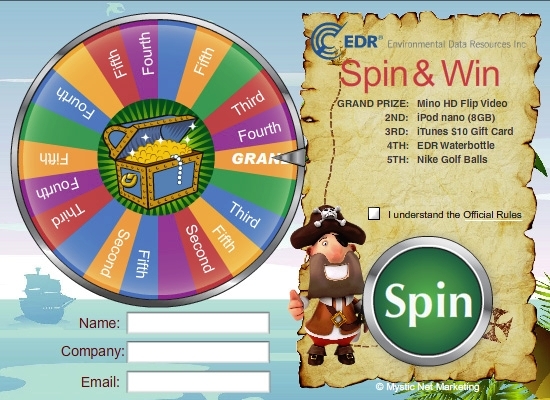 The Virtual Prize wheel also creates a fun element to any business and promotion. It is an amazing lead generation tool. It works 24/ to generating leads and positive results . 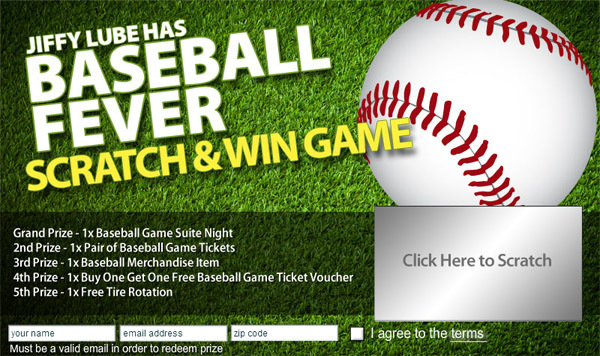 It is easy to install and features a secure administrative set up of prizes and odds. Tablet technology is driving new interactive marketing tools. The fast growth of the tablet will allow businesses to engage current or potential customers in new ways. Virtual interactive marketing games collect marketing data and increase brand awareness. 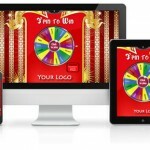 Creative mobile applications such as the Virtual Prize Wheel is fast becoming an important tool for consumer engagement.. Photos and demos coming soon. Gamification is the use of game design techniques to engage audiences. 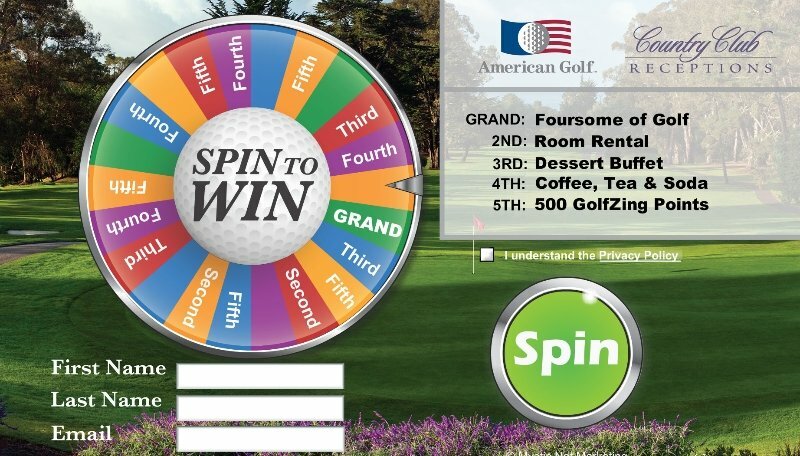 This Virtual Scratch Off marketing game does just that, as well as acts as a lead generator and prize or coupon distribution system Incentive Promotional Marketing is a powerful method of connecting businesses with consumers. Brand Gaming offers odds & inventory controlled interactive promotions. With a move to mobile browsers and tablets you’ll need new ways to keep communicating with potential customers. 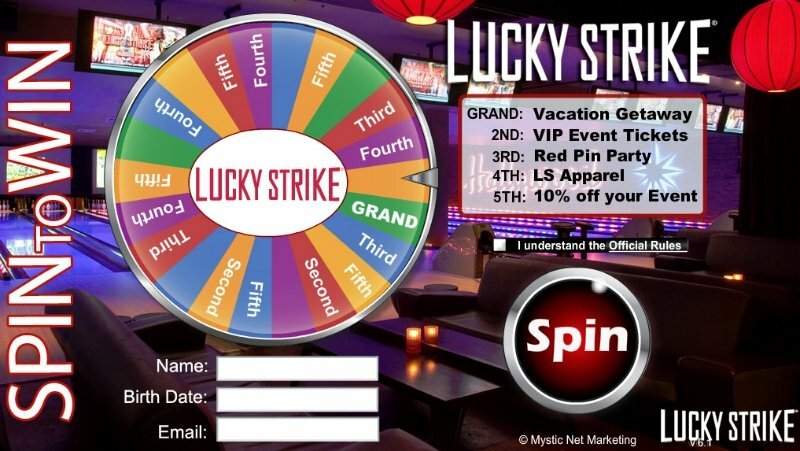 Offer them a fun and unique brand experience with a Virtual Prize Wheel. 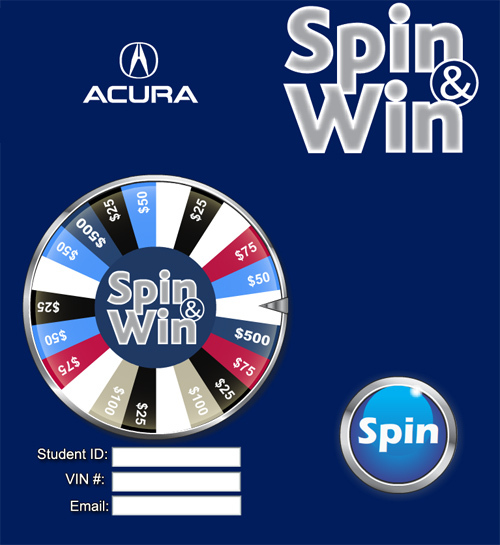 Text the word: Spin to 27126 and you will receive a code to Spin. Update: We canceled this service. It did work great! 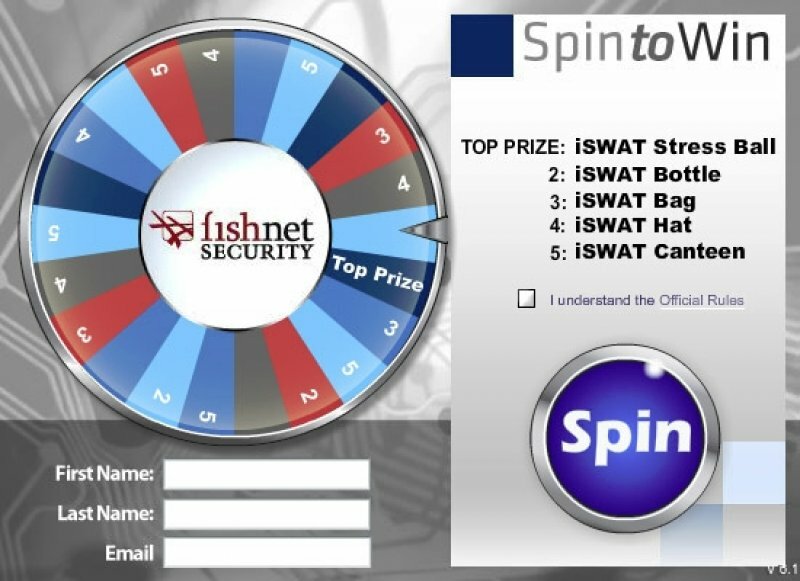 This Virtual Prize Wheel gives you the ability to collect both the player’s mobile number and their email address. than to send you the code to play. 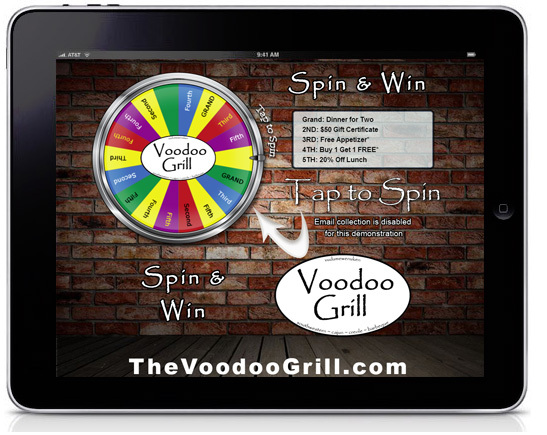 iPad – iPhone Interactive Prize Wheel. iPhone and iPad Prize Wheels. 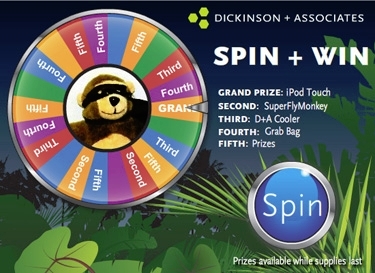 The iPad Prize Wheel marketing game is best run in Kiosk Mode. Click below to play a demonstration. Plenty of companies say they have interactive banner ads but they are not so interactive. This ad is truely interactive. You play the ad itself, without being redirected or tricked into a long survey to play. 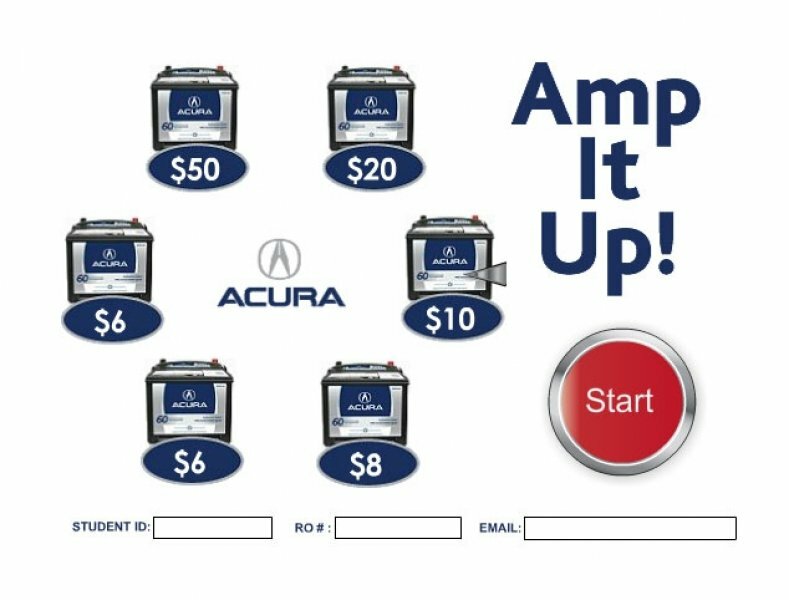 There are so many auto dealer promotions in this virtual prize wheel, I’m not even sure where to start. Take the image below. This one was done as an incentive to sales people. Every time they sold or leased a car, they logged into the special website and entered the VIN number for a chance at up to a 500.00 bonus. 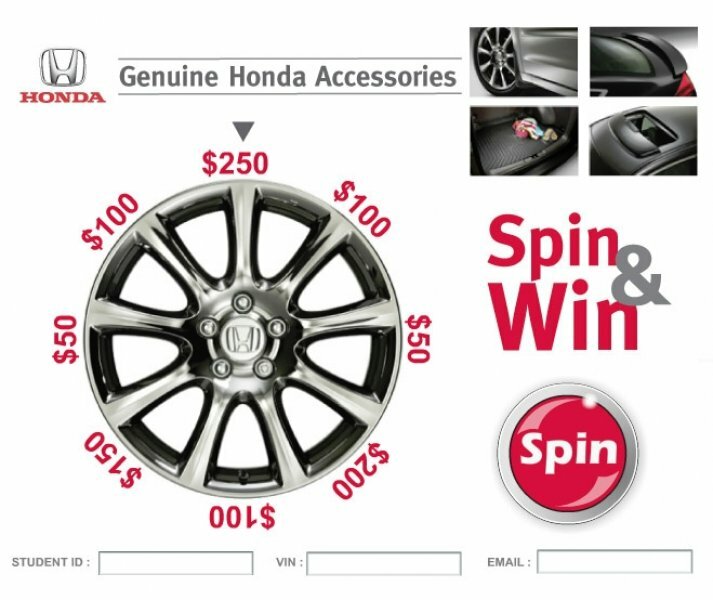 The virtual prize wheel allows you to control the odds and prizes for your automotive promotion. This auto dealer promotion can also be used for the client that bought the vehicle, or upload the VIN numbers of past buyers and invite them into the dealership for a chance to win. 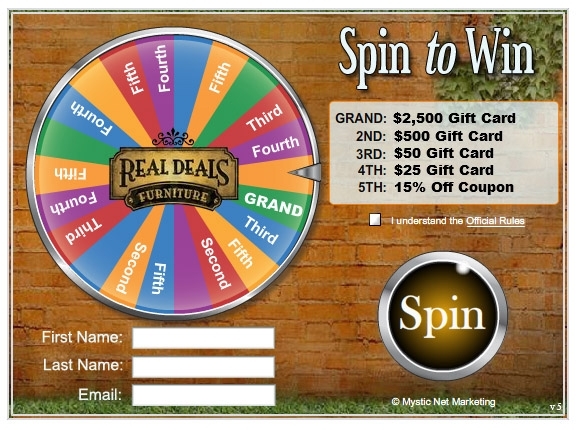 10 fast marketing ideas for Salon’s and Spa’s using a Virtual Prize Wheel. 2. Create am in-store Point of Purchase display to engage players. Offer discounts on specific brands and give away overstock products. 3. Have contests with your staff. When they reach a goal they then receive a spin on the prize wheel. 5. 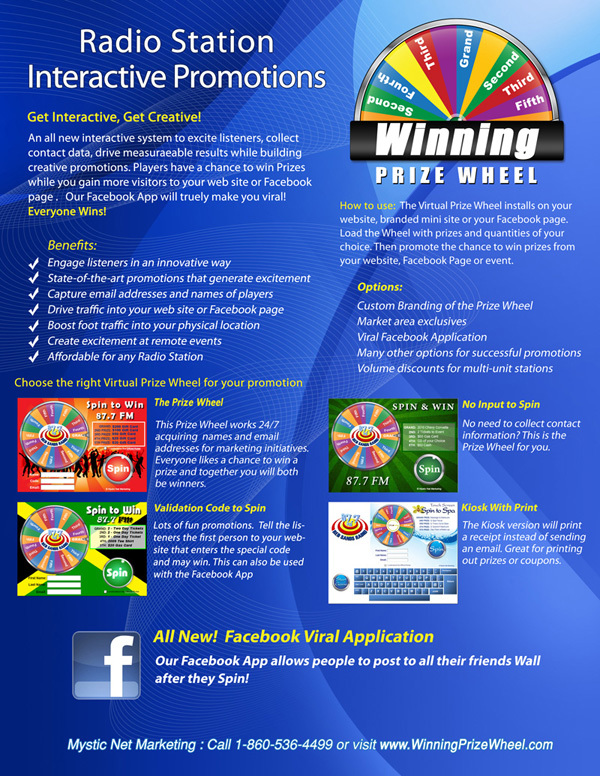 Offer the virtual prize wheel on your Facebook page requiring clients to Like the page in order to have a Spin. 9. Use it to encourage Gift Card sales from your website. Buy a Gift Card get a chance to win. 10. Partner with distributors or like businesses and everyone will benefit from a controlled interactive promotions. 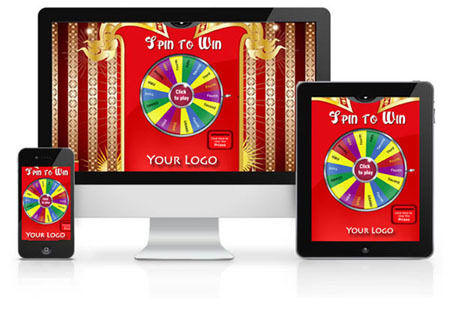 The virtual prize wheel is as versatile as your imagination. 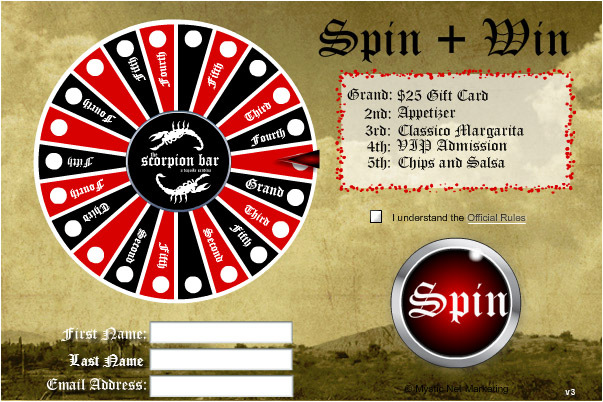 Below is an example of an actual Restaurant Table Talker – Prize Wheel Promotion. You set the odds, you set the prizes or coupons. A branded email is sent to all players. 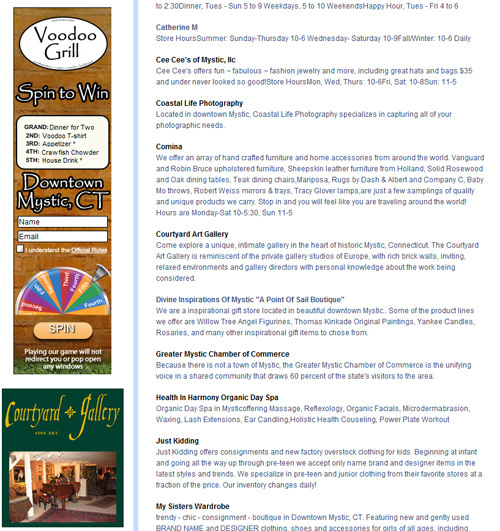 Below are a few no brainer promotions. I bet creative radio marketers could find many others. Basic: Add it to the website to engage listeners to build your email database. Use the Unique Code to Spin and post a unique code to Facebook every hour for the first person to get to the wheel. Or go read off the secret code to push people to the website to play. Sell sponsor-ships for each prize level. Then within each prize level of the email that is sent will contain additional graphical coupons or messages specifically from the advertiser. Sell the Wheel to a single sponsor and run it from the stations website. 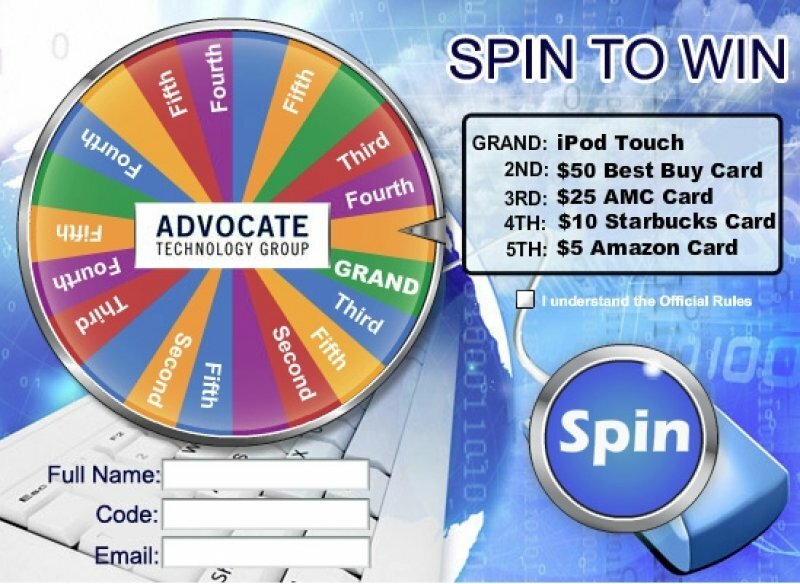 Build the campaign to include the wheel and the chance to win from the sponsor. You will find an increased response rate for the advertiser and they get the email list of all the players. 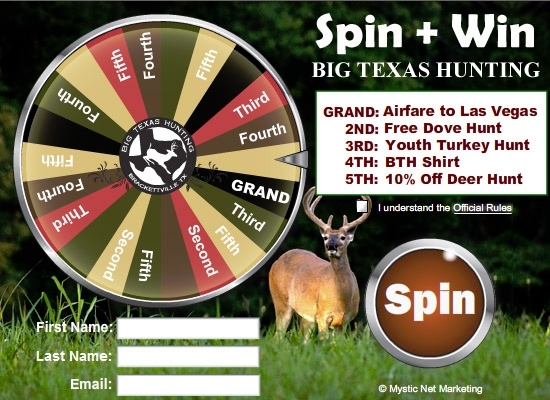 Have a single grand prize and stretch the promotional period as long as possible, then instead of doling out prizes almost everyone that spins will be entered for a second chance to win. This promotion can be tied to our system that send out a unique code in each email. They can later come back and use that code on the Unique Code to Spin Wheel. Use at Remotes running at full screen, instead of the old ballot box stations use. On receipts or on business cards ask patrons to visit your website to participate in a survey and for a chance to win a prize. 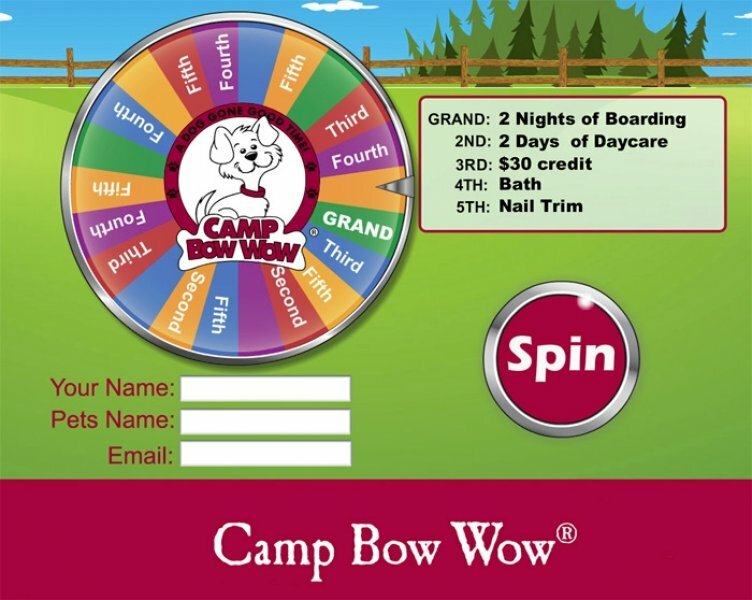 Once they fill out a survey they will be redirected to your Virtual Prize Wheel. You collect valuable data and they have engaged with your brand. This restaurant promotion is highly effective. 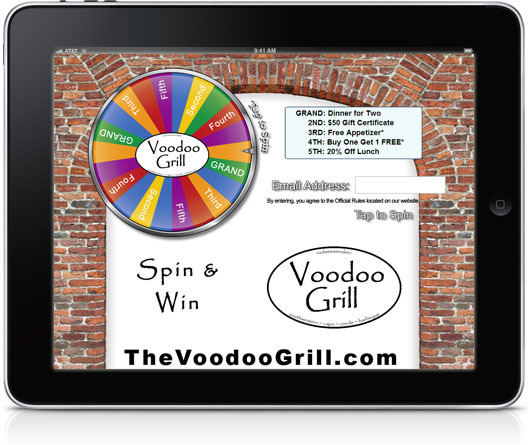 Use the Virtual Prize Wheel in your current advertising that is circulating. 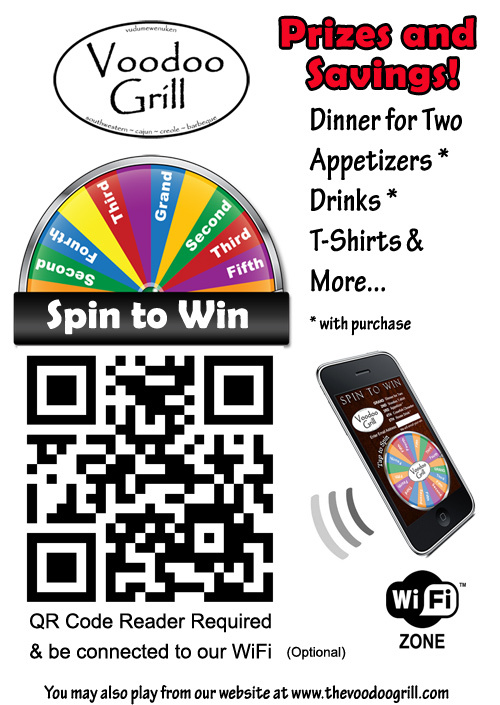 People will notice a chance to win a Dinner for 2 by playing virtual prize wheel at your web site. Offer a cup of soup, a free drink, whatever food product you can afford to give away to motivate players to become customers. This restaurant promotion will also help you build your email marketing list very quickly. 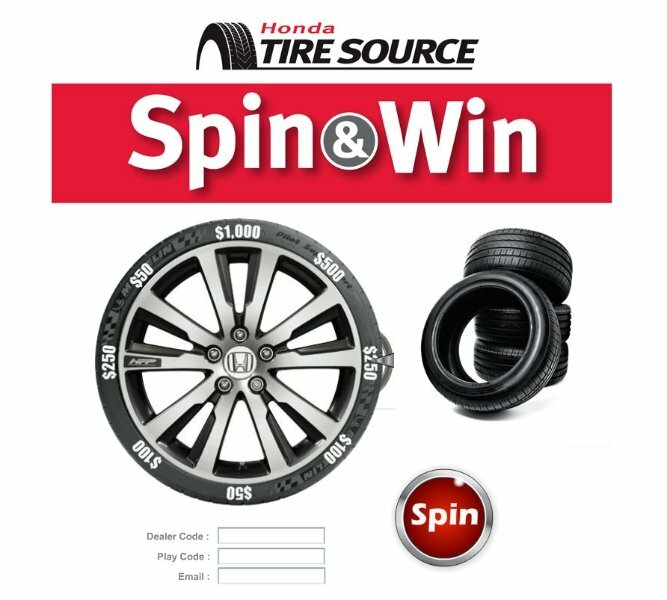 Use a Virtual Prize Wheel for the #th Caller, “Do a Spin to Win per Hour” Who ever is the #th Caller gets a chance at the Virtual Prize Wheel. 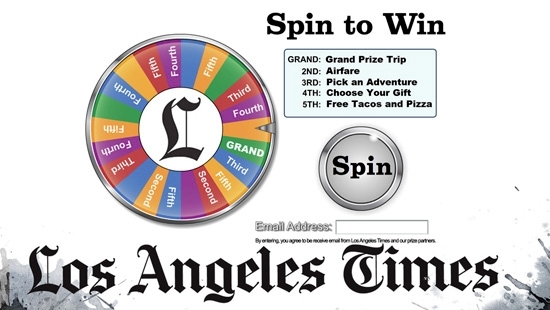 This could either be done on-air with the DJ just spinning the prize wheel, or go off air and give the winning caller the address to the website where the prize wheel is located and give them a special number or word to use to validate that they are to be there. Below are a few no brainer promotions. Creative radio marketers could find many others. Sell sponsorships for each prize level. Then within each prize level of the email that is sent will contain additional graphical coupons or messages specifically from the advertiser. 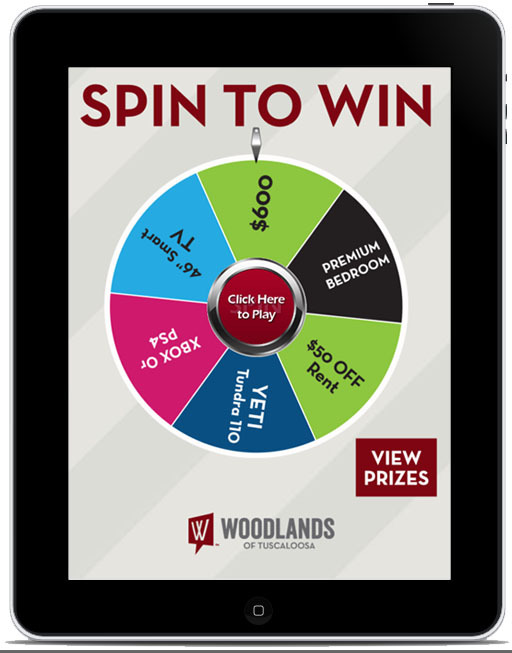 Promote your apartment complex with a Virtual Prize Wheel. It could be used to get new tenants in or to keep the old ones in. There are many different ways of using the wheel to help your business. New tenants’ appreciation, someone signs a lease and they get a chance at the wheel. Winnings could be many of things, such as discount of rent, gift certificates, etc… It could also be an incentive for your tenants to pay their rent on time. If they pay by the 10th, then they get a chance to spin the wheel. If the prizes are intriguing, there is more incentive for the tenants to pay on time. Promote your moving company with the Virtual Prize Wheel! When people are moving they go and search for the best deal. They go from website to website, why not stop them at yours with giving them a chance to win. If they win something, such as a discount on their next move, they more then likely will choose you over the next moving company. They will inform their friends of the virtual prize wheel on your site and they will probably use you the next time they move. It will help increase sales and keep people coming back. 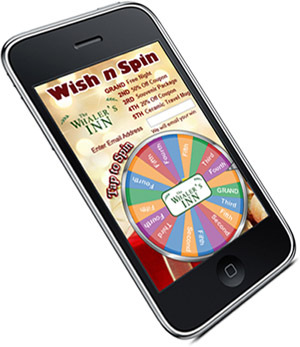 Promote your location with the Virtual Prize Wheel. With the New Year here and New Years Resolutions to be done, the fitness and recreational centers are one of the hot spots. With people looking and comparing location to location to find which would be the best for them, attract them to yours by giving them a chance to win. Once they win, they will have to come to your physical location to redeem it. Once they are there, they will get a first hand look at your place. 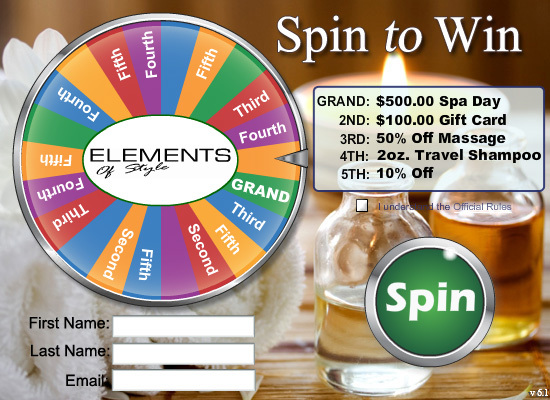 Use the Virtual Prize Wheel as a Monthly Promotion for current members or a visitors incentive. People enjoy having a work out partner and most fitness centers allows you to bring a guest. Once they bring their guest in they will see the Kiosk for the Virtual Prize Wheel. This will be an incentive for them to join your fitness or recreational center, especially if they win a discount towards signing up. With all the data that you collect through the Virtual Prize Wheel, you can get to your members and guest easily each month. Promote your region by using the Virtual Prize Wheel. Tourists are always look for new places to visit and more then likely start online. Attract them with giving them a chance to win something that would benefit them while they are visiting your region. You could ask the fellow businesses in your region to help fill up the wheel with different prizes or coupons, such as dinner for two at a local restaurant, 50% off stay at a local hotel, etc… With this, it will attract those potential tourists to come to your region to redeem their prize or coupon. Hopefully they will like their stay and will continue to come back year after year. 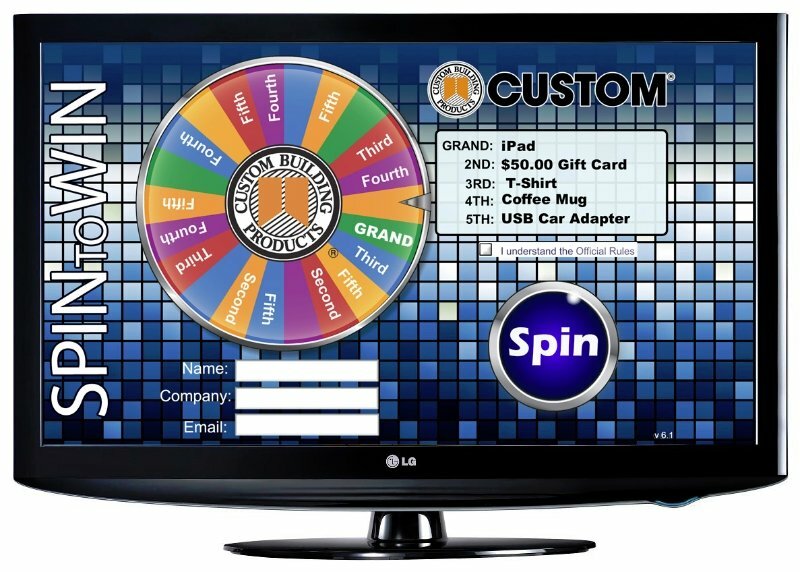 Promote your Radio or Television Station with the Virtual Prize Wheel. With the way technology is going, people are more apt to go online to listen to the radio or watch past shows. 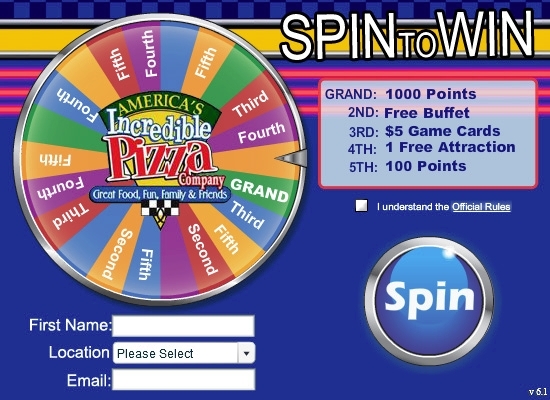 You can entice them to do this by having a Virtual Prize Wheel on your website. There are many ways of making the wheel work for you. Use it for Weekly/Monthly giveaways or Event Ticket Giveaways. Doing this will increase the flow of people to your website. Imagine all the new subscribers it could bring. It will help your brand get recognized with this innovative engaging promotion. To increase sales, you could use the Virtual Prize Wheel internally. Use it as a Sales Incentive. This will help get your agents to be more productive and essentially increase the sales.